Solve links email messages to contact, company and project blog records automatically. This works very well for contacts and companies because names and email address are specific and predictable. However, project blogs have less specific information to link by and email messages may not include the necessary hints to automatically link the way you need. 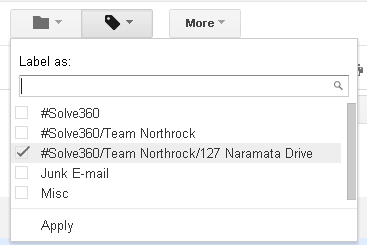 Using your Google Apps account you can now link a specific Gmail message to a specific project blog using Gmail labels. It’s like having a dropbox in Gmail for each of your project blogs. Create a label under #Solve360/your_workgroup/your_label_name where “your_workgroup” matches the workgroup in which the project is shared. Each user should do the same in their own Gmail account. The workgroup of the project blog and the workgroup in the label above must match. This feature also works with contact and company records. As you’re working just apply the Gmail label and the message will automatically be shown in the corresponding project blog. That’s it. The newly labeled email message, that is normally private to a Gmail account, is now shown on the project blog, regardless of the email content or other project blog linking criteria. Using a central feature like labels to link messages is simple and powerful because it can be applied from many applications - within any Gmail web client, on desktop or mobile email clients and within Solve’s own Webmail feature. As a reminder, the shared Gmail message is viewable on the project blog everywhere you find Solve - web, mobile phone, or tablet apps and the Solve Gmail contextual gadget. Add a Gmail label to an email, the message shows up on a (property, case, location, …) project blog in context with other details, later the team reacts to an important detail that would have otherwise been hidden in a distant inbox … client replies “You guys ROCK”.